Though body art is seen by the wearer as an expression of who they are, many times this expression interferes with one’s job opportunities. Many employers do not allow for exposed body art other than a few piercings in the ears. Employers are even allowed to deny someone a job due to the fact that he has too elaborate visible body art. “According to the Equal Employment Opportunity Commission (EEOC), employers are allowed to impose dress codes and appearance policies as long as they do not discriminate or hinder a person's race, color, religion, age, national origin, or gender” (Robo). Most companies who are strict about appearances even have exceptions written into the employment contract. "In our employee manual, we have a section about employee personal appearance where it says 'no excessive piercing and tattooing,'" said Duncan Browne, senior vice president of Newbury Comics, a Boston, Mass.-based chain of music and comic retailers in an interview with Regina M. Robo for Phototonics.com. Tattoos and excessive piercings seem to get a bad reputation when it comes to the business world. According to Careerbuilder and Vault.com 42 percent of managers said their opinion of someone would be lowered by that person's visible body art. 44 percent of managers said they had tattoos or body piercings in places other than the ears. 81 percent of respondents think piercings in places other than the ears are unprofessional. 76 percent of respondents believe visible tattoos are unprofessional. Due to the fact that it is a well known fact that excessive body art is risky for certain employment some tattoo parlors will not even do some tattoos due to where someone wants it. 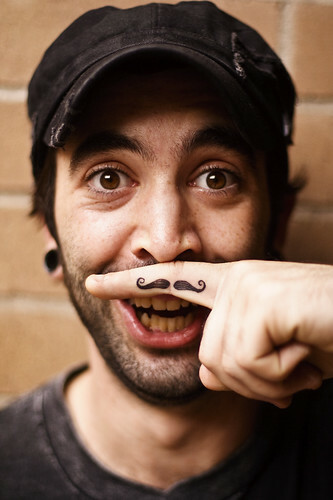 I personally knew a guy who wanted to get a moustache tattooed on the inside of his finger so that he could put it to his upper lip like he had a real moustache. When he went to the tattoo parlor the tattoo artist said that he would not do the tattoo because the placement of it could cause my friend to have limited job opportunities. Robo, Regina M. "Body Art in the Workplace." Photophonics.com. Jan. 2007. 30 Apr. 2009 .